Each year on May 25th, geeks around the world celebrate the life and works of author Douglas Adams. Deemed the unofficial “Geek Pride” day by fans, and originating on May 25th 2001, this fun little holiday has grown each year. Douglas Adams is known for his popular series Hitchhikers Guide to the Galaxy, which was originally a BBC radio comedy show that aired in 1978, and later developed into a “trilogy” of five books that sold more than 15 million copies in his lifetime. This popular series was adapted into a BBC TV series, several stage plays, comics, a computer game, and in 2005 a feature film staring Martin Freeman and Yasiin Bey (Mos Def). Adams’s contribution to UK radio is commemorated in The Radio Academy‘s Hall of Fame. Adams also wrote Dirk Gently’s Holistic Detective Agency (1987) and The Long Dark Tea-Time of the Soul (1988), and co-wrote The Meaning of Liff (1983), The Deeper Meaning of Liff (1990), Last Chance to See (1990), and three awesome stories for the classic television series Doctor Who. 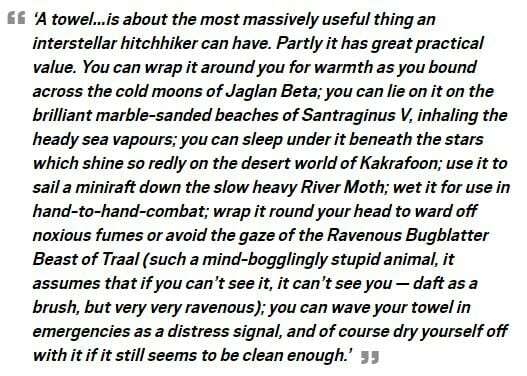 So what does a “Towel” have to do with Douglas Adams? 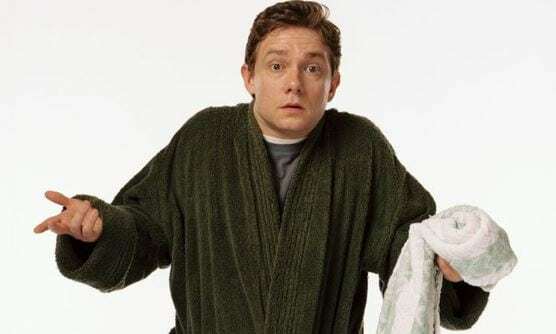 In Hitchhikers Guide to the Galaxy, the characters referenced the towel as the most important item you could have with you through your galactic travels. 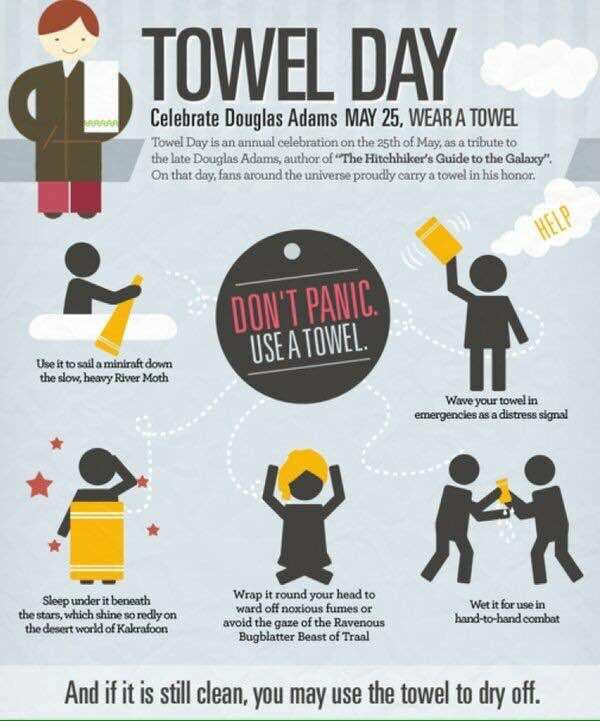 As such fans tweet #TowelDay, post towel themed pictures, art, carry around their towel all day, and enjoy just a little bit of geeky fun in Douglas Adam’s honor. 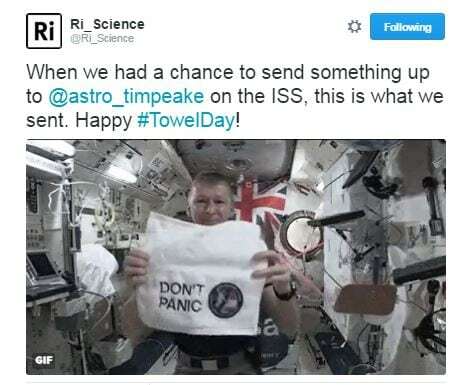 For example, as a Towel Day gift, the Royal Institution tweeted a video of ESA astronaut Tim Peakeaboard the International Space Station, showing a “Don’t Panic” towel. It was released while he’s still up there. If you want to salute him when the ISS passes above your head, you can check here the times for your location. Last year, the International Space Station also posted a video to celebrate the day. A candy shop in Florida has gotten in on the fun and created a candy based on the fish-like creature, the Babel fish, from the series. You can see the video on how this candy fish is made on YouTube. You can read more fun happenings from around the world on towelday.org. Also, as an aside, apparently some little known Science Fiction film was released today 39 years ago. You might know it as Star Wars.